And by this time we are hungry. And in need of coffee. What’s up next? Good Wok. They’re closed. Of course, it’s Sunday morning. Next? Alberto’s Pizza. What about that place across the road? South End Cafe? Molly Coddle must be the next cafe. Where’s that? Back up the hill. Damn. 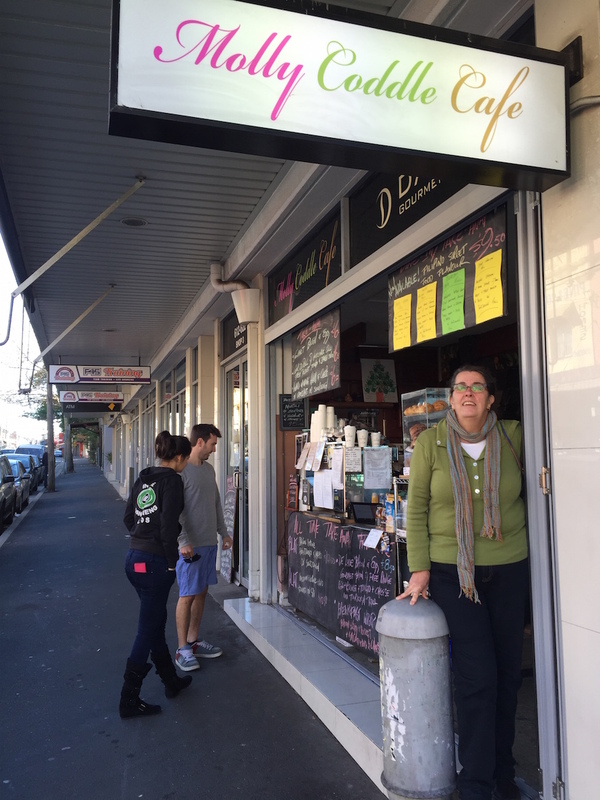 So that was how we found ourselves at number 612 – Molly Coddle Cafe. Good name. Makes me think of eggs, which is very appropriate as by now I am a bit hungry. 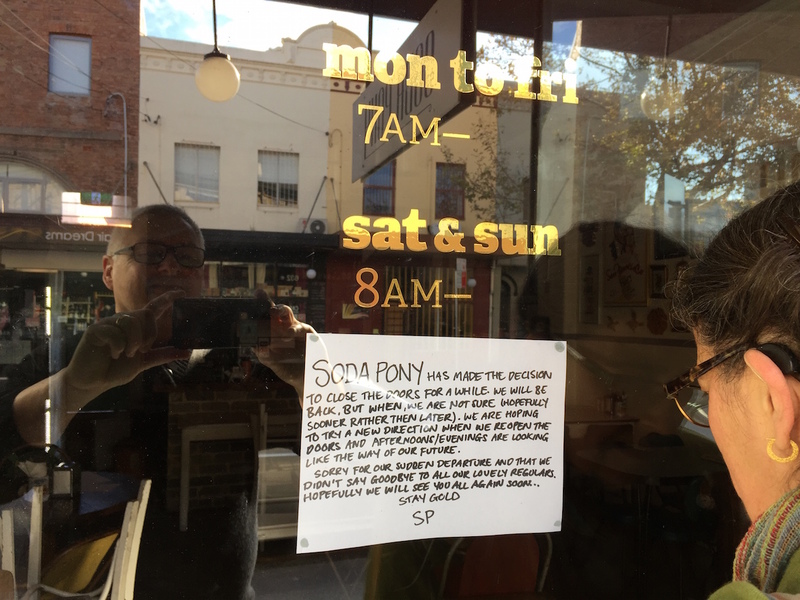 The cafe is doing a steady trade in take away coffees from the big espresso machine in the doorway right out front. Inside there are a few locals but plenty of room for us to join them. We choose a tiled table tucked away near an enormous and slightly dusty pizza oven. Unfortunately it is not on so we have to keep our coats on. It is my turn to have the big breakfast, but Strop throws caution to the wind, in typical Strop fashion, ordering the corn and beetroot fritters on the basis that it comes with cauliflower relish. She is a sucker for anything cauliflower. And orange juice for both of us, please. Coffee can wait till later. While we are waiting, we occupy ourselves listening to the cheesy music, humming along to Let It Go, trying to keep the hand movements restrained enough not to be noticed by the staff who might think we are trying to get their attention. Strop is busy trying to work out if an email from Paypal is legit or some kind of phishing thing. Is phishing still a thing? You don’t hear so much about it these days. Once upon a time it was phishing this and phishing that, everywhere you turned. The OJ is excellent despite being jammed full of ice, which always seems superfluous. It is frothy, sharp and sweet – new season navels, Strop says knowingly. My big breakfast lives up to its name, leaving little room on the plate for manoeuvring. The eggs are excellent, there is plenty of bacon, the chorizo is a welcome newcomer, and the tomatoes are tasty. The only player letting down the side are the baked beans which seem to be the same ones I grew up with. Strops fritters are large and pink and smooth. – they look like a pile of underdone steaks. There is no sign of the cauliflower relish. Strop queries this and is supplied with a little pot of tomato relish. She polished off the salad component but most of her fritters are still sitting on the plate when we order our coffees. The waiter clearing our plates asks How was everything? oblivious to the pile of pink fritters staring up at him accusingly. The coffee was pretty good though. 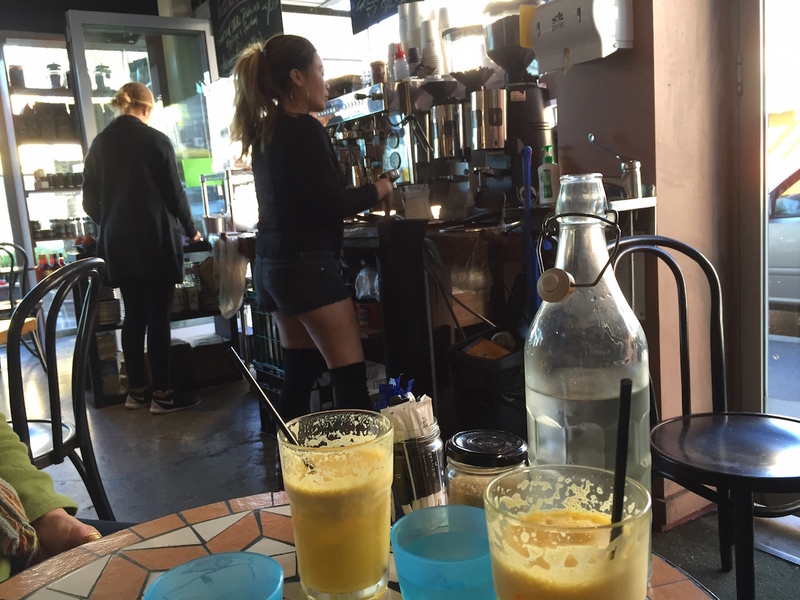 It can’t have been too cold for the baristress to have taken her skirt off. Sometimes I think fritters are the last stop before superfluous veggies make it to the compost. That can be the case in this house anyway! I think they would have been relish if there were chunks of corn or beetroot in them and they had the Cauli Pickle – but I think they were just ‘flapjacks’ with some beetroot juice waved past them. No real flavour discernible, sadly.